Beautiful start to Friday with scattered cloud, light breezes and just a hint of cool in the air as I climbed aloft to get a look at things. Down at Dee Why there were a few folk in the water just north of the club where it appeared they were chasing knee high little wavelets. Given the direction, you might find a tiny improvement in the better north corners, but don’t expect anything much above waist high. The Sydney directional spectrum chart from 0500 was showing 1.1 metres of 12-sec south (162-172°) swell out at sea. Tide is currently dropping to the low at 1050. Weatherwise we’re heading to a high of 28C and a possible late shower. The current light winds will settle around to the NE as it builds to 15-20 kts for the afternoon. 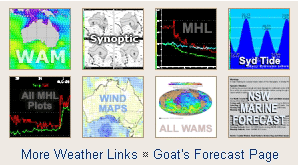 As always, the Goat has rolled out his weekly prognostication on matters surfing overnight. Check out the words of wisdom here. A high pressure system over New Zealand will continue moving east today, extending a ridge to the north coast, and bringing a southeast to northeast flow to the New South Wales waters. A cold front will bring a strong and gusty south to southwesterly wind change to southern parts of the coast on Saturday before extending north on Sunday. Winds will tend to the southeast later on Monday as a high pressure system moves into the Tasman. North to northeasterly 15 to 20 knots increasing to 20 to 25 knots in the evening. Mostly sunny day. The chance of a thunderstorm later tonight. Northerly 20 to 30 knots turning westerly in the early afternoon. Winds reaching up to 35 knots in the evening. 1.5 to 2.5 metres, decreasing to 1 to 1.5 metres during the morning, then increasing to 2 to 3 metres during the afternoon. Below 0.5 metres, tending northeasterly 1 to 1.5 metres during the morning. Cloudy. 90% chance of rain and the chance of a thunderstorm. Westerly 20 to 30 knots tending southwesterly 15 to 25 knots during the morning then east to southeasterly about 10 knots during the afternoon. Southerly 1.5 to 2.5 metres.